This book tells the story of the ancient land named Chianti and the modern wine appellation known as Chianti Classico. In 1716, Tuscany’s penultimate Medici ruler, Cosimo III, anointed the region of Chianti, along with three smaller areas in the Florentine State, as the world’s first legal appellations of origin for wine. In the succeeding centuries, this milestone was all but forgotten. By the late nineteenth century, the name Chianti, rather than signifying this historic region and its celebrated wine, identified a simple Italian red table wine in a straw-covered flask. In the twenty-first century, Chianti Classico emerged as one of Italy’s most dynamic and fashionable wine zones. Chianti Classico relates the fascinating evolution of Chianti as a wine region and reveals its geographic and cultural complexity. Bill Nesto, MW, and Frances Di Savino explore the townships of Chianti Classico and introduce readers to the modern-day winegrowers who are helping to transform the region. The secrets of Sangiovese, the principal vine variety of Chianti, are also revealed as the book unlocks the myths and mysteries of one of Italy’s most storied wine regions. 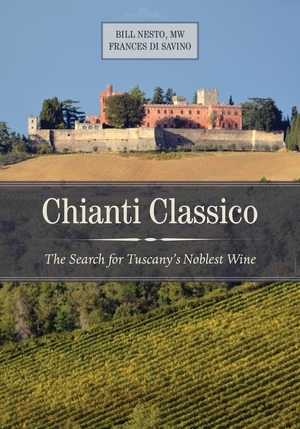 The publication of Chianti Classico coincides with the three hundredth anniversary of the Medici decree delimiting the region of Chianti on September 24, 1716. Bill Nesto is a Master of Wine and a founder of the Wine Studies Program at Boston University, where he is also a Senior Lecturer. Frances Di Savino is an attorney with a background in medieval and Renaissance studies and is Bill’s partner in life and on the wine road. Bill and Frances coauthored The World of Sicilian Wine, which won the André Simon Book Award in 2013. Fran Di Savino and Bill Nesto discuss Chianti Classico on I'll Drink to That! Talking Wine, hosted by sommelier Levi Dalton and wine retail owner Erin Scala.